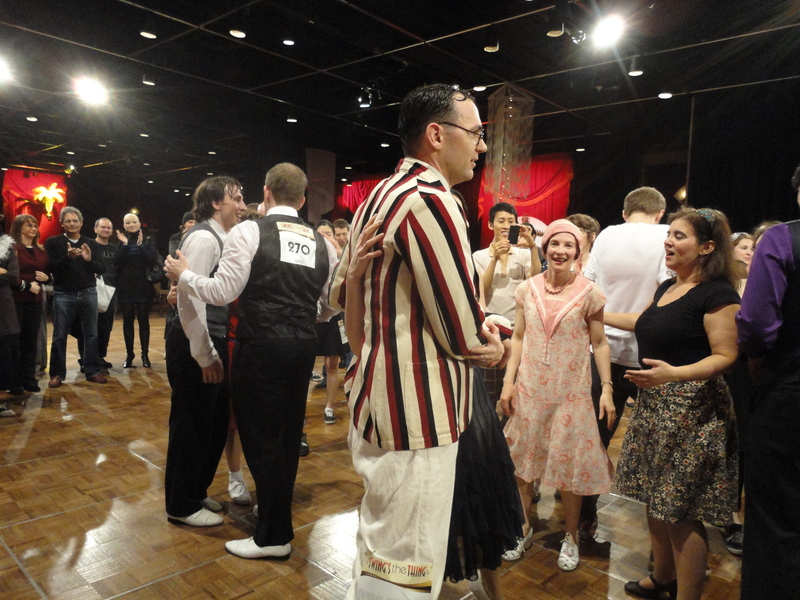 Here are some pictures I took this weekend at the Bally’s Swing Dance Off co-sponsored by Yehoodi.com. Another one of those times where I wish I was a better photographer. Or at least a decent one. But there are a few things I captured that I want to talk about more generally in future posts, so I thought I’d put them up especially since this particular series tells a nice story. It occurred to me that I said that I was going to post my other Lindy Focus video highlights and I never did. Well the long wait is over. And because this slipped my mind I included some super special sauce footage at the end of this post. There’s been a lot of interesting chatter about the Lone Star Championships and Dax & Sarah’s television appearance. I’ve been trying to put some thoughts together since Lindy Focus about some of the issues that these two recent events bring up, but I don’t have anything coherent yet. That’s mostly acombination of me being too busy and people saying thoughtful stuff. Until I can get something together, check out a few video highlights from The Snowball over in Stockholm Sweden which took place over the New Year holiday at the same time as Lindy Focus. My favorite has to be this bluesy hip hop improvisation done by Joyss with the Gordon Webster Septet. Sarah Breck and Dax Hock were on the television show “Live to Dance” recently. Unfortunately for them, Dax injured his back before their performance in the semi-final round. However, I think it probably was for the best because it gave the judges something to talk about other than the dance itself. One of the best line up of swing dance musicians of our generation will be playing at the DC Lindy Exchange this year. I tried thinking of different ways of writing this up without being as hyperbolic, but this is about as plain as I can make it. The best big bands from the west coast, that have headlined the biggest Lindy Hop events in the country, will be playing here on the east coast. Together. On the same stage. DCLX. I’m talking about Jonathan Stout’s Orchestra and Crytzer’s Blue Rhythm Band. You read that right. DCLX is bringing in TWO full big bands from the other side of the freaking country. The likelihood of this happening again anytime soon is probably never. Seriously, no has their stuff together to do this on the west coast, and it’s going to happen in Washington-effn’-DC. All of this is part of DCLX’s huge 10th anniversary. Not satisfied with putting on a usually great event, they’re pulling out all the stops this year. Over on Swungover, Bobby ventures once more into the breach of dance analogies by busting them all out. They’re all fun, but I thought I’d put this one in context. He’s referring to Nina dancing with Marty Klempner in the Cats’ Corner Division (Champions Strictly Lindy Hop) at The 2007 American Lindy Hop Championships. And yes, they won. I remember riding back down to DC with Naomi Uyama, which is about a 7-8 drive from Stamford, CT. Every once in awhile, no matter where we were in our conversation, we would just suddenly stop and say something like , “Damn, that Blue Dress Dance was amazing.” Over and over again, the whole way down. Analogies seem to be in fashion these days, and Lindy Focus is a good one for the way our scene has been developing for the past few years. What started out as a very small regional event, has now blossomed into one of the biggest in the country. I’ve been to the last three Lindy Focuses (Focii?). The first was Lindy Focus 7 just when the event was expanding by hiring bigger name instructors and bands. Now there aren’t just more attendees, but they’re more diverse in terms of experience level. I go up to the counter to pay for my hot chocolate. The cashier asks if I want to buy a bag of coffee grinds. She catches me at a bad moment. Instead of smiling and simply replying, “No, thank you,” I dead pan “I hate coffee” deliberately overlooking the irony of our location. She smiles undaunted and replies instantly “Surely you must have some friends that enjoy coffee.” Not a question. A statement. I briefly consider spitting out “I don’t have any friends,” but I’m not playing a lone gun for hire. Instead I make my stand on privelidge and scorn. “I don’t socialize with any of those kinds of people.” I draw out the word “those” as if it’s 1961 and no one has marched on Selma, Alabama yet. We lock eyes. She knows no upselling will happen this day, at this transaction, but there’s a pause as if she’s considering another try just to piss me off. I already have a line at the ready. Something inappropriate involving dead puppies. I’m hoping, daring her to go there because I’m already here. Then she smiles. The damning truth is evident. She’s already won. “That’ll be $3.69 please” she smirks. I curse under my breath as I realize that this game was over long before the coffee grinds gambit. I squeeze my credit card in despair. I consider taking out the twenty in my wallet just to make her break it. But the truth is clear. I’m the one that’s broken. “Would you like a receipt?” she chirps. Her finger on the register ready to produce a physical token of my defeat. “No.” A beat. “Thank you.” I gather up what’s left of my dignity. I shuffle off to get my drink, wondering where the cute cashier is today. I’m super busy this week, but I hope to put up my final part of my favorite 2010 videos series later this week. I’m re-writing it (ok, I never finished writing it) because of some fun conversations and performances at Lindy Focus last week. But I can’t make any promises because I’m taking care of the new bosses. Then some time after that I’ll put up some thoughts about Lindy Focus. In the mean time I thought I’d point out the cross blog conflagration over Bobby White’s ill worded analogy about following. (btw, how’s that MFA program working out for you, dude? Just kidding) It triggered a lot of thoughtful and interesting responses. It’s cool to go through them if only to see how well connected the Lindy blogosphere is these days. Go Team!! It also proves my theory that you can generate a lot of attention by talking some s#!t, even if it is inadvertent. I’m just glad that I’m not the one drawing the fire this time around. “Swing Analogies: A Great Follower is a Proactive Passenger” by Bobby White on Swungover – I wish Bobby hadn’t taken down the original post if only to see what triggered this hullaballoo. Don’t skip ove the comments because those are good too. “Creative Coloring” by Jason Meller at Dancing Past The Godzilla Threshold – This post pre-dates Bobby’s but Jason added this into the comments thread o Bobby’s post and that triggered the following response. “A Long Winded Reply” Jason clarifies. 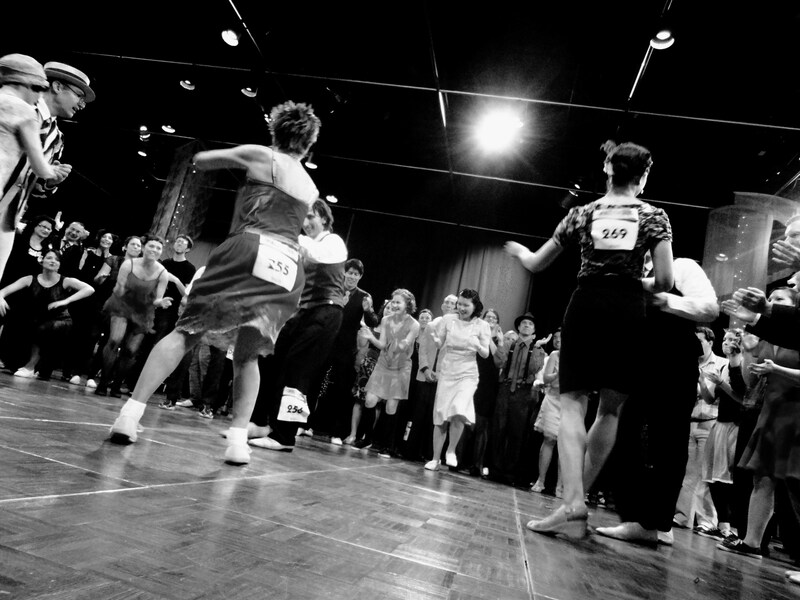 “We Need to Be Past the Passive Follow in Lindy Hop” by Sarah Carney at Thrive – Sarah adds additional commentary on the gendered aspect of leading and following. “How About Some Clouds With That?” by Ann Mony – +1 for Ann for using videos. “Leading and Following, Dancing and Partnership” by Gina Helfrich – Gina’s blog rises from the dead and ties everything together. In addition I strongly recommend that you guys take a very critical look at the Invitational Lindy Hop Jack & Jill from this most recent Lindy Focus because there’s a lot of stuff happening in those clips that is very relevant to this discussion.